NDA 1 Application Form 2019: To get admission in the Indian Defence Forces, candidates will have to appear in the National Defence Academy (NDA) Exam. NDA 2 Exam is going to be scheduled on 9 September 2018 but NDA 1 exam will be held on 9 January 2019. UPSC will release the notification to fill the NDA 1 Application Form in the month of January and it will be last to February. Interested candidates can register for the NDA 1 Registration Form before the deadline and submit it with the examination fee. The application form will be filled in 2 parts i.e. Part I & Part II. See the detailed information in this article to fill the application form. 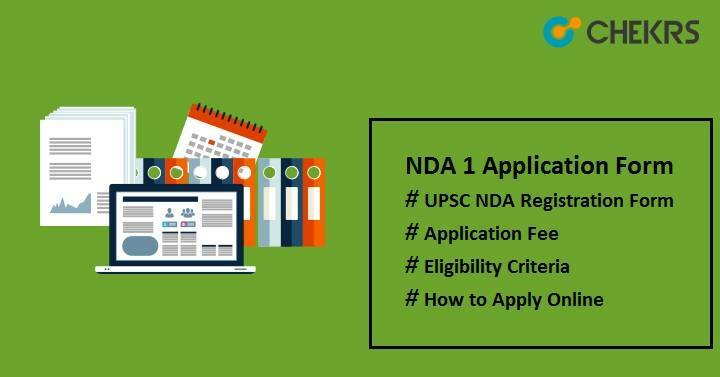 Candidates must check the UPSC NDA I Eligibility Criteria before applying for the NDA 2019 application form. It is compulsory to satisfy all the criteria prescribed by the UPSC official authority. Students who failed to meet the admission criteria will be not allowed to appear in the exam. So be careful while registering you for the exam. Applicants should be citizen of India. NRI, PIOs, OCIs candidates can also apply for this. Candidate’s age should be lie between 19 years to 16 years old to apply for NDA NA examination (I). Aspirants, who born in Nepal or Bhutan but living in India can also apply. Tibetan refugees who came before January 1, 1962 for settling in India permanently are also eligible for this examination. Applicants should have passed 10+2 from any recognized central or state board. Candidates should be physically & mentally fit as per the physical rules defined by the officials of NDA. Check the given below table to know the requirements required at the time of filling registration from. A new window will open, where you can see a table for UPSC NDA I Registration Form with 2 links namely “PART-I Registration” and “PART-II Registration”. Read all the instructions carefully and after this click on “Yes” button to proceed for the application form. Fill the form with the correct information of candidates like his/her personal details, academic qualification, contact address etc. Click on “Continue” button to move to the next page. On the next page, there will be option to update the form. Click on “Update” button to update the filled form if required. At last, select “I Agree” to submit the form. Note down the Registration no & date of birth for further use. To take the print of filled application form after submitting it, click on “Print Application Part-I”. Click on “Click here for Part-II Registration”. Enter the registration no, date of birth and captcha available there and then click on “Submit”. Select the option to pay the examination fee between Pay by Cash/ Pay by Card/ Pay by Net banking. After the successful completion of payment of application fee, move to the next procedure by clicking on the “Continue” button. Select the examination center as per choice and convenience. Upload the scanned images as per specified format and click on “Continue” button. Read the declaration message and then click on “Finally Submit”. Click on the link “Print Application” to take the print-out of final application form. Students will get notification after final submission of the form on his/her registered mobile no and mail id. We hope that the mentioned information will helpful for all candidates who will apply for NDA NA 1 Application Form. Keep checking this site to get update related to NDA 2019. Also Check our separate Article for NDA Syllabus and NDA Previous Year Question Papers. Best of Luck for the exam and keep Visiting !!! Hello Shivansh! Most probably in 2021. Good Luck and Maintain good performance in 11th and 12th. Thank you and Keep Visiting. My D.O.B 12 apr 2000 can I apply for nda-1 and nda-2 exam 2019 or not? Hello Shivam, According to the Age Criteria for NDA 2019 Exam “Candidates must be born between 2nd July 2000 to 1st July 2003 to be eligible for NDA I”. For NDA II, DOB must be in between 2nd January 2001 to 1st July 2004. So may be you are not Eligible for NDA 1/ NDA 2 2019. however Check the Official Notification before deciding anything. Thank You for your Compliment Brijraj, We will try to maintain the same quality. You can also check our other article related to NDA 2019. Keep Visiting. Hello Sumit, Your Query can be answered after the release of Official Notification, But Some sources indicate the expected age criteria as “The candidates must have DOB on or before 31st of July 2002, to be eligible to apply for NATA 2019 exam. and He/She must have 17 years of age as on or before 31st of July 2019”. So Chances are that you are eligible for NDA 1. But once check Official Notification before going for it. Hello Vivek, According to the Age Criteria for NDA 1 Exam “Candidates must be born between 2nd July 2000 to 1st July 2003 to be eligible for NDA I”. So may be you are not Eligible for it. however Check the Official Notification before deciding anything.